One of the goals of our TechHive internship is for high school interns to create an interactive museum exhibit as their final project. Not only do they get to learn and utilize valuable skills, such as programming and prototyping, but they also take part in promoting a hands on learning experience for visitors of all ages. In preparation for their final project, TechHive was able to do a mini-showcase of our Robot Petting Zoo on the museum floor on Day 4! After working on them for a couple days, each of the teams set up a table with their cardboard creations and a computer to run the many moving and blinking components of their design. This would activate movement, light, and sounds in different ways. For example, one of the robots would play the pokemon theme song, while another would scream and sound an alarm every time someone got close to it. Either way, our young visitors loved feeding them as many puff balls as they could as fast as they could! The interns learned the importance of building a narrative with their intended audience -- in this case, both parents and children! Every parent was impressed with the idea of high schoolers building something fun and interactive for younger kids. One parent was totally surprised when she went to feed a fish and it quickly closed it’s mouth on her hands. She also loved the sound effects! One of our young visitors noticed the interns were using Scratch and asked if he could try changing some things, such as how fast one of the robots was talking since he couldn’t hear it very well. We were happy to let him work on it and felt that it made the showcase even more interactive! Overall, both the interns and our visitors loved the welcoming, fun, creative aspects of our Robot Petting Zoo! It was a good learning experience for our interns to watch how children interact, play and learn with their creations. 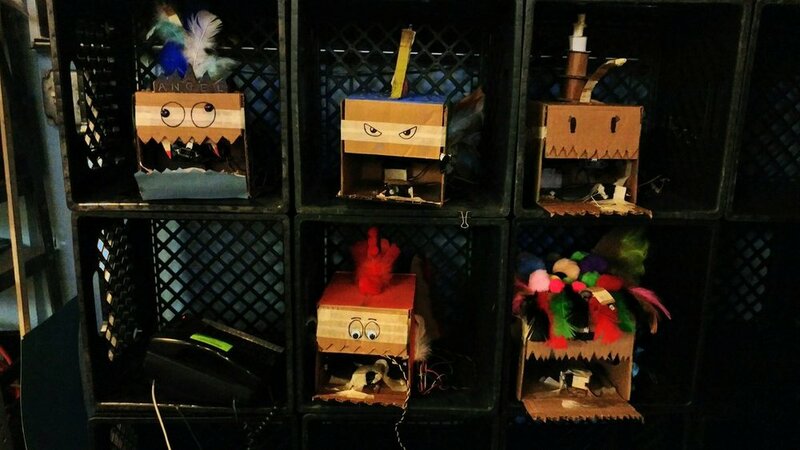 If you want to join our team of zookeepers, check out how to build your own Robot Petting Zoo here! Check out our Twitter to enjoy the rest of what our interns are up to! Happy making!